This is our very first edition to our monthly newsletter and due to the fact that we are just starting out, this bulletin is naturally short. 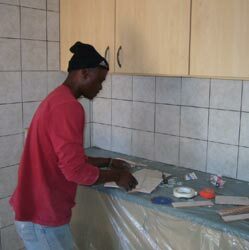 We are proud to share a positive item as our first contribution - during the month of May 2007, Chris Gous and his team blessed the Home by tiling the entire kitchen from floor to ceiling - it looks beautiful! There are very exciting plans in the pipeline for Masigcine Children's Home and we look forward to sharing them with you over time.